Location, location, location! 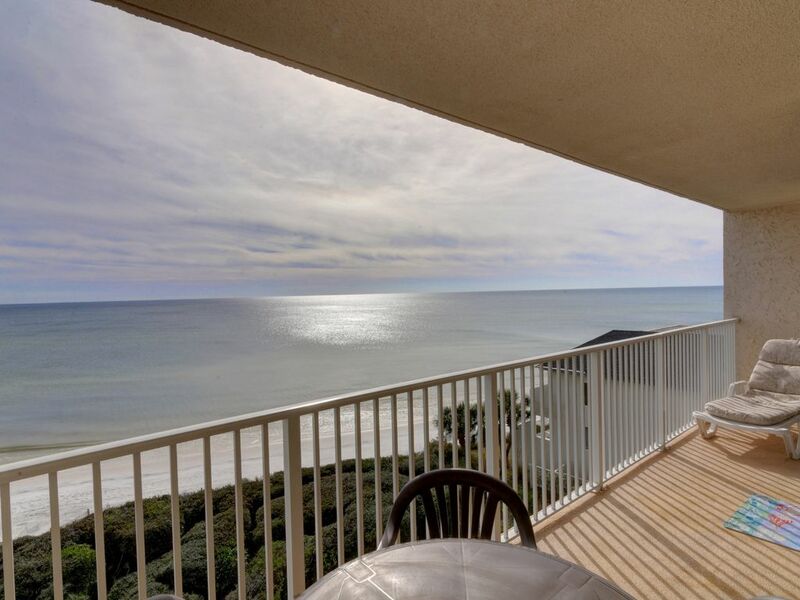 Our Oceanfront 2 bedroom condo is located 1 mile east of Seaside and situated in the center of Seagrove Beach, so you can walk or ride your bike to shopping and restaurants. There are bike racks conveniently located on the property and a bicycle rental shop directly across the street. This property sits on a private beach with no public access, providing plenty of space to spread out. For a change of pace, you can lounge beside the gulf front pool (heated Nov-May), which is located close to the gas BBQ grills and picnic area. The most beautiful sunsets you've ever seen (not to mention romantic) can be experienced every evening from your private balcony. Far away from big city lights, you'll be amazed each evening when the stars light up the sky. As the moonlight dances across the water, the waves will gently lull you to sleep. This spacious, unit has been completely remodeled and comes with the amenities you deserve while on vacation. Because this unit is owner/operated and not operated by a management company, our attention to detail and comfort sets us apart from the standard 'bare bones' rental units. We provide pillow-top mattresses, thick, fluffy bath towels and soft high thread count linens. Located directly on the beach, you'll enjoy a beautiful panoramic view from both the master bedroom, living room and outside balcony that extends across the living room and master bedroom. There's a fully equipped kitchen with granite counters and modern appliances, stocked with all the necessities to satisfy all of your cooking or baking needs (we even include a crock pot and sharp knives!). A full size, modern, high efficiency washer & dryer allows you to pack lightly for your trip. The little 'extra's' that help make your vacation complete include, a cooler to take to the beach, an extra large beach bag for all your beach gear, 4 over-sized beach towels AND complimentary beach chair service (weather permitting March-October). The living room has been furnished with a custom upholstered sectional with enough seating for the entire family. New electronics that include a large 50' flat screen SmartTV connected to High Definition cable with extended sports channels...you won't miss any of your favorite football games when visiting in the Fall! There's a Blu-ray DVD player and a library of G-rated DVD's to enjoy family movie night. The master bedroom is furnished with a king bed (pillow-top mattress), 32' flat screen TV and Smart Blu-ray DVD player. The private master bath has a granite counter on the high-top vanity (comfortable for the tall guys! ), and a shower/tub combination. The second bedroom is furnished with 2 twin beds (pillow-top mattresses), a 24' TV with DVD player and HDMI cable provided so the kids can connect their game system. The second full bathroom adjacent to the 2nd bedroom has a shower/tub combination. You're on vacation, but just in case you have to stay in touch with the office, high speed wireless internet on a secure network is included at no charge. The SmartTV & SmartDVD player have been connected to our Wireless Internet Service, making it possible for you to access your Netflix, Amazon, Hulu, etc.accounts. Complimentary Beach Chair set up (weather permitting) March - October) is included so you'll enjoy the sugar white beach and the emerald green water that's so clear you can see your toes wiggle (The crystal clear green water is why this area is called 'The Emerald Coast'). Build a sandcastle, or grab a book from the extensive library of books we've provided and relax on your private balcony and watch the dolphins play right in front of you. Leave the hustle and bustle of city life behind...your cares and worries will fade away as quickly as the tide. Come stay with us and you'll discover that paradise really does exist. THIS IS A NON-SMOKING UNIT (ALONG WITH SMOKING PROHIBITED INSIDE THE UNIT, SMOKING IS NOT PERMITTED ON THE OUTSIDE BALCONY). Parking is by permit and available for 2 vehicles. Golf carts and trailers are not permitted on the property. Vehicles without the proper permit posted on the dashboard will be towed away. I recently rented this unit for a week at the beach with 3 other teacher friends. It was clean, well-maintained and nicely decorated for a relaxing, casual beach atmosphere. The balcony doors are a good quality and easy to operate, no jumping the track like in some places we've rented. Blinds were also in good repair. We loved sitting out on the balcony and watching the ocean while eating our breakfast. The kitchen had everything we needed and the pans were in good shape. The condominium was in good repair, elevators, outdoor areas and pool all clean and in good shape. We didn't use the grill area but it looked well-kept. I would go back. The view says it all. The condo has everything you could want. Fully stocked, very clean and well managed. We did rent bikes and one of the baskets were taken. No fault of the rental just adding so you have knowledge. Just lock it up as well. We had a great spring break trip at this incredible property. The property was beautiful and the views were gorgeous. Seagrove is an adorable area filled with friendly locals and visitors. We will definitely be back and our fingers are crossed this unit is available. The property was exactly as pictured. We loved every minute of our stay! This was our fourth time staying in Seagrove and this was by far the best place we have stayed. Loved the views and the sounds of the waves. Debi was wonderful to work with!!! We will definitely return next year. Very clean and had everything you needed to enjoy your stay. Extras like ice cooler,beach chairs,beach towels,toys,games,movies,books and everything you need in kitchen. Only thing was needed new mattress.it was terrible for a two week stay. Would stay again if got new mattress. Also would put key pad on door. Please note: The mattress in master bedroom has been replaced with a new pillow-top king mattress set.